Using excellent Nikkor manual focus lenses on such a great sensor with no any focus help (no split screen on the OVF, no live view in the viewfinder with magnification) will soon cause a very frustrating awakening. The only way to focus will be at arms length same style like with a point and shoot using Live view and magnification. All my Pentax DSLR can change the split-screen (and I use them successfully). I am surprised this camera can't. On my Pentax it is a cute option. On this camera which is emphasizing the use of manual focus lenses it would be a must. For me the whole benefit of manual focusing is that it frees you from the tyranny of fixed focus points. The camera just focuses wherever your eye directs, through the agency of your left hand. I ditched my split image screen in favour of a ground glass screen and found my pictures were much improved. I would compose the shot, and focus anywhere I needed to on the screen. If you are framing a child's face for example, waiting for an expression to flicker across it, whilst keeping the composition correct and the focus on the eye (wherever that may be, seldom bang in the centre), I don't see any other way to get it right. A beautiful camera and looks great to work with from the standpoint of settings and controls. A pleasure to use I'm sure, and with the D4 sensor images should be stunning. Perhaps the Df2x will bring the D800 and manual focus together as one. I didn't think the Dƒ was going to be reasonably afforadble for me -and it's not c'est le guerre. However I did not expect it to be so down spec'd. 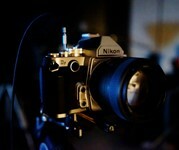 I assume as DPR apparently does, that Nikon is jumping on the retro bandwagon to try and generate some actual turnover. That's great. But I think they missed the fundamental point which is the the EM-5 especially and the XPro-1 actually bought something to the party other than a lick of silver paint and a vague resemblance to the cameras of old. There was a discussion about this in the M43 forum. As far as I can tell, this is a basically a D600 in a retro package. Oh and they removed the video - which I don't really get - yeah not every one wants it, but since there almost certainly using the guts from other cameras that have it, why not keep it? $800 for a lick of silver paint - that's not a very compelling sell. If I could afford it, I'd probably buy a D800 or as Andy says a D610 and a decent lens. I don't understand how it has the same megapixels as the D4 and the same processor as the D4, but half the shots per second (5.5 vs 9 to 11). And the worst thing in my opinion is that it is so expensive. Surely a camera for artists should be dirt cheap? The left over mirror boxes of the D600 can't do more than 5.5 fps. Plus some firmware limitations, so that the D4 still can outperforme the DF. Different shutter, different mirror box, different CPU. Why should it be "Dirt Cheap"? Is Nikon supposed to subsidize your activities? You don't need this camera to be an artist. 2750$ for the body only. I will see in my pocket if I find the screw that is missing in Nikon's marketing director's head. Nikon will never learn. They can get it. It's Nikon. People were in love with it before they knew anything about it. How many companies can say that? Seems to me Pentax offered a kit with a 35mm lens (K30? ), which is essentially a 50mm view. So, it hasn't been *that* long since someone has offered a standard FL lens in a kit. And Pentax has always had full compatibility with its old lenses. Everyone's making it sound like this is a new concept. Spot on! Agree with Andy,s thoughts on this one entirely. Its 1983 again... Can a digital SLR fit into the same size/weight package as a manual focus compact film SLR? This is a step in the right direction - perhaps a few too many dials/etc.It looks like a cross between my Nikon FG, an FM2 and a F3HP. Hope they keep up the retro design(s) but at more affordable prices. I hope a future model has at least 24MP. Nikon's manual focus viewfinder on their film cameras were excellent in contrast/brightness with manual focus lenses. Hope this one also achieves those high standards. CanNikon DSLRs have been humoungous for too long (Pentax, Canon SL1 and a few others excepting). Ok, I understand that there's lots of old men yearning for the days they still had hairs and teeth, but I fail to get the usefulness of "analog" ISO, exposure AND exposure comp dials. What's the point of a top LCD for? If your eye is on the VF you can see all the info you need and you've got twin dials to change stuff. A single button well placed for changing ISO is all that's left. So they have a tiny top LCD and jumongous dials for the sake of redundancy. And no video... cause this is a camera for "real" artsies! C'mon! Even the oldest fart just might want to take a video of his grand grandchildren demolishing his gear or something. Oh well. Oh, just forgot, no focus peaking or twin focus. Beautiful piece of bad design choices though. AND you cannot realy focus the old brigth fixed lenses!!! I you need a explanation for shutter/ISO dials, look at either the Canon G16 or the Leica M (Type 240). Jesus Christ. People whining about control dials and top LCD! Not longer than 3 years ago you'd be laughed for writing something as stupid as that. And now you only see support. Sad times. ppl go down the drain. Oh..! Seem to have given the game to Sony, right? Not quite! The Sony lacks lenses. So Nikon gave the game away to Olympus? I think so - the EM-5, at that! The EM-5 is modular, has all the quality a hand-held need produce, has all the lenses you need.... I would've sold up for the EM-1, but there is no point. I would've sold out to the Sony A7, but it's too soon. I would have loved to sell out to the Nikon, but that's not possible. If the product is right, then I'll take it and sort the price as required (worth any misery). But right now the winner is the Oly EM-5. Really - it is, unless you're shooting sport / in the studio / cropping heavily, or have to spend ages in post. A desperate me too attempt. Nikon trying to protect it's turf and in process losing on both ends. Wrong caption for image 8 - should be f/1.8G. Otherwise, good 'hands on' article. Much better than the overly-colloquial 'first impressions' piece. Nikon this is pre production, please redesign the camera! You just described Fuiji's. If you actually want to buy a camera why don't you just get one instead of complaining? I don't understand your argument there. I always want new cameras and love retro dials and designs, but they have to be ergonomic and this fails on many fronts. Perhaps my points describe Fuji designs so well because they are so good at designing retro cameras. I've owned many Nikon DSLRs over the last decade and I don't hate the new designs, but I do think this Df could have been much better (more mechanically than aesthetically). I also own the Fuji X100 and that is part of what makes this new Nikon so much of a let down. I'm all for dials, but the lack of an aperture ring on the 'kit' lens is just wrong. They should supply it with the earlier 50mm. 70's? I think it looks mid eighties. The silver one reminds me of their cheap plastic film cameras. Hm maybe another 5 years then Nikon will follow Minolta. Don't think its going to be bought by Sony. 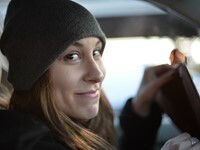 Sony actually does pretty well with the Nex line, though they do price and design lenses pretty awkward. Shame they didn't rush to make and price proper lenses before coming out with great new cameras, but I doubt they'll be going down. Why is this not manual focus? And smaller? What on earth induced Nikon UK to only sell this camera with a kit lens? Surely the target market for the camera already have standard 50mm lenses in their armoury (I have two 50mm f/1.4 of different vintage and certainly don't want another 50mm). Now we know where they placed those unused D600 shutter and focusing components. Also "Made in Japan" apparently costs an extra $850. and it should be cheaper to have a new low resolution sensor than cleaning the dust-oiled one. I'd say it's a nice camera, but no focus aids on a camera that accepts all old manual focus lenses really is a big omission. I hope it accepts the focusing-screens of the F3. 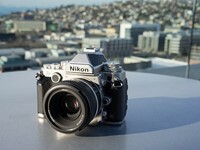 I totally dig retro camera's, but the Nikon looks too frankensteinish to me. Especially the silver version. Compare it to something like a classic Olympus OM film camera. The Olympus has a much cleaner look. Big bulky and too expensive better to get the EM1 or G7. Tom_A no not in all other ways. It is not as well made as the E-M1. Manual focus is not as easy. Single point AF is slower. Handling speed for those that need it is slower. @Tom_A, the df obliterates nothing about the EM1. The EM1 destroys the DF in autofocus speed and accuracy. I know this because my current Nikon DSLR has the same crippled AF unit. Once you try the Olympus AF, you know it nails every shot, and you feel crippled when you get back to your Nikon DSLR. What good is full frame if half your shots are out of focus? What are they thinking putting an APS-C AF unit in a full frame camera anyway? The EM1 destroys the DF in stabilization on fast primes. Sure you can get VR on zoom lenses, but not on the f/1.4 and f/1.8 primes. That and the Olympus lenses are generally better than the Nikon ones. It's a matter of taste of course, but that 50mm f/1.8G is rubbish. "What are they thinking putting an APS-C AF unit in a full frame camera" - Because there is no such thing as a full frame AF unit. That's why all the focus points are in the middle. Although I agree that this AF unit is utter trash. I've been playing with the D600 for a while now and it cannot focus in low light. I'm shocked at just how bad it is! Just how do you know the AF in this Df is so bad? Have you used this body? Let us see a real test before assuming how the focus will be be. It is however a much more realistic assumption that the big and sensitive sensor will allow to make pictures that are simply impossible on those small sensor cameras. Not to mention having much better bokeh for a given viewing angle. What a bummer ! Another 39 AF point FF...I was hopeful of a 51 point AF looking at the AF-ON button in those teaser videos..
Was expecting the camera to be at least 24 megapixel or higher especially for the steep price. I hope Nikon comes out with some faux retro lenses that are overpriced as well. They should have made some lenses along the lines of Pentax's limited primes to go with this. It would have been funny if they had designed the battery to look like a 35mm film cartridge. That would have been epic. does it mean D600's shutter? And/or D600 mirror mechanism (apart from the sensor read out electronics which for a D4 sensor aren't limiting here, shutter and mirror movement are what limits frame rates). I went soft after looking at these pictures... Nikon you led me on! Samfan said it looks gorgeous... well to me the chrome version looks like a fat FM is wearing a silver beanie cap! I prefer Sony A7,E mount many lens can using....Leica M is my lover..
Well I have to admit it does look gorgeous. That said, Nikon still completely missed the point of why would people want an old-fashioned camera. For crying out loud, it comes with a G lens!! Seriously, no aperture ring? And what about that plastic back? And the price, well, that settles the whole thing. It's another camera for rich hipsters, sorry to say. Jeez... Just go on eBay and buy yourself whatever you want. Someone forbid you from using old lenses that you whine so much, or what? I disagree about the price which frankly should have been higher, c.$5000. Limited edition, too. That's a drop in the bucket for attorneys, doctors, dentists, stock brokers and believe me, there are a lot more of them then there are serious photo hobbyists. And these guys and gals won't split hairs over locking knobs and focusing screens. Who do you think buys Porsches, $15,000 re-issue Les Pauls and African photo safaris? Follow the money. I still have my SP 1,F-1, F-4 and F-5 film cameras. All of them are still above par to all my digital cameras which I purchased. With the exception of Ricoh GRV. camera. How must will it cost you for a repair. WTF, no XQD card? And SD instead of CF? What the heck? CF too big? look at he Size of this camera! Yea. CF too big because of the camera size. This looks very promising. Need to check all the controls and the workflow. but where is the aperture ring on the lense ? This camera is mainly for people with lot of old manual Nikon lenses. "The vertically-mounted front dial controls the aperture when shooting with Nikon's G-type lenses that don't have aperture rings." Yes, does it cater for manual focusing? That's the issue. The focus screen is much like any other Nikon SLR. There's no manual focus aid, but you can turn AF point illumination off when using MF lenses. Less features for more money? Nikon deserves to make money off any fool willing to buy this. Well this fool would like one. More money for more build quality. I like it and don't mind paying a bit more for a quality constructed instrument. Build quality does not look like full metal like D800 - only top bottom and frame - like D610, D7100 etc. Quality instrument like the broken D600? It just looks different. They are all quality instruments, whatever that means. ....and its not even April 01! If they were really clever, they would have made it possible to mount Canon FD too. You are joking right? Back to the basics of two shutter speed dials? And look at all of the buttons and dials on that thing. I think he's probably drooling for other reason. As in, he's always drooling. Not joking, I like it! And, I seriously don't understand all of the rabid, knee-jerk herd-mentality comments of irrational hatred here, nor do I see a need for so much condescending and arrogant rudeness. What did I do to you? Nikon, please ignore this tiny, bitter and self-loathing minority of very vocal naysayers here. I wish your company success, and verily I hope to have such good fortunes ahead that will allow me to purchase my first (hopefully top-of-the-range) Nikon someday. Cheers to all my fellow quality design and engineering lovers! Why do people on the internet get so over excited and say things to people they would never say in person ? It's a camera - if you don't like it don't buy it - simple. 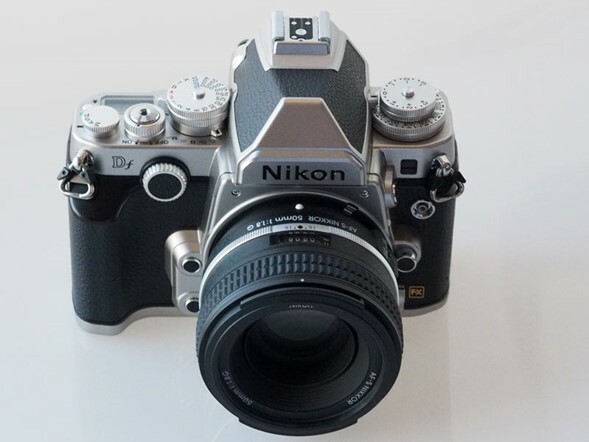 Nikon Df First Impressions Review: Is this retro done right? The widely rumored and much-leaked Nikon Df is here. The Df is a 16MP, full-frame DSLR with the sensor from the flagship D4 and the 39-point AF system from the D610 packaged in a body inspired by film cameras from the 1970s. The Nikon Df can't shoot video, but it will accept 50 year-old non-Ai lenses. A lot of Nikon users have been asking for a 'digital FM2' for years. Is the Df that camera? Click through for our first-impressions.